Since the start of the Industrial Revolution around 1760 in England, mankind has experienced an explosive growth in ideas and products which have had an enormous positive impact on human lives. From the Agricultural Revolution, where mankind first learned that food could be cultivated, to the start of the Industrial Revolution—a span of about seven thousand years—human productivity is estimated to have been about constant, at somewhere between $400 to $550 in annual per capita GDP (in constant 1990 dollars). That is, for seven millennia there was essentially no improvement in things like caloric intake, life expectancy, or child mortality, on average, worldwide. That’s depressing. It was the ideas of the Industrial Revolution that enabled this change. Certainly there were a great deal of things going on, and a variety of factors that came together to enable the success of the Revolution. But the ideas were the key. And they were successful in no small part because of the growth in real knowledge. Not only was the industrial world changing in the mid-late 1700s, but so was our ability to reliably learn things about our surroundings. Isaac Newton founded modern physics when he published the Principia Mathematica in 1687. Quite a few crazy ideas (i.e., phlogiston) persisted for a while, and some even helped push along the Industrial Revolution in spite of their wrongness, but the advancements and refinements of knowledge that came with the adoption of the scientific method helped to make these revolutionary ideas form and then come to reality. Ideas, then, can be powerful things. Good ideas, perhaps even more so. So it bears asking, where do good ideas come from? Where do we find the ideas that change the world and help to make it a better place? Assuming we want more of them around, this is an important question to ask. It also was the subject of an excellent, and appropriately named book by Steven Johnson in 2010. I found his answer to be quite surprising and insightful. Johnson suggests that the nature of good ideas is combinatorial. That is to say, good ideas are novel combinations of already existing ideas, generally adapted to new purposes or solving new problems. Putting things that we already know together in ways not done before can enable both incremental changes, and in some cases it can lead to sea changes in capability. This combination process is the heart of what is known as innovation. Every patent cites the prior work it is derived from. Every scientific publication references the work that it is built on. Every artist has other artists who inspire their creations. Johnson is not, to be fair, the first to make this observation. Abbot Payson Usher remarked in his book on mechanical inventions, that revision and reinforcement of previous inventions was how new inventions were created. Indeed, when steam engines were used to drive grain mills in the days of the Industrial Revolution, the novelty of the invention was in how it coordinated existing ideas to make a more efficient system—doing what was already being done, but doing it better, faster, cheaper. When Einstein would ponder problems he would often let his mind wander to make new connections between ideas floating around in his mind, a creative technique now known as “combinatorial thinking.” And when Isaac Newton famously remarked that had he seen farther than others, it was because he stood on the shoulders of giants, this was another way of saying that he combined existing ideas and extended them to make new ones. In this view, biodiversity is then a very real form of innovation. This combinatorial picture of growth is all well and good, but is it true? If it is, how might we know? I explored this once before, but it is worth revisiting. The adjacent possible, as we said, is the set of all first order combinations of the actual. There is an area of math that is all about counting combinations that we can use here. Let’s say there are n objects in the actual. We want to take them k at a time and let k vary from zero all the way up to n, thus taking all possible combinations into consideration. That is, take all of the individual items themselves, then take them in groups of two, then groups of three, and so on all the way up to the whole bunch at once. Sum up all of these numbers and that is the size of the adjacent possible set. For a simple example, take objects A, B, and C and combine them in all possible ways. First you can have each of them individually (giving us back our original three: A, B, and C), this is k=1. For k=2 we have three combinations, AB, AC, BC. For k=3, we have just one combination, ABC. We haven’t thought about k=0, which is no objects, but that’s a single real option which needs to be included. So the total number of combinations is then just 3+3+1+1 = 8. You may recognize the result as an exponential. That is, the size of the adjacent possible set is exponential with respect to the size of the actual set. Every time n increases by one, the sum of all the combinations doubles. The question then, is how does n grow in time. This can be found by the amount of time it takes for the sum to double. A constant doubling time is a signature of exponential growth. Now that we know what we’re looking for, the question is where should we look. It is probably not a bad assumption to equate scientific literature with ideas. That is, when a research group learns something, it is generally a good assumption that they will publish it. Because the first to publish something new generally gets the discovery credit, publishing is important in the scientific community. So measuring the quantity of scientific literature over time probably provides a realistic measurement of scientific knowledge or scientific ideas. In 1961, a survey of scientific literature was done by Derek Price. In the less technologically advanced days of scientific publishing, abstracts were popular. It was far easier for a scientist or engineer to look through these abstract publications for papers he or she might be interested in reading than to carry around or dig through entire journal volumes. So to count the quantity of scientific publications, Price went to the abstracts. And what he found was that the cumulative sum of abstracts doubled every fifteen years. It didn’t matter the field, Chemical Abstracts, Biological Abstracts, and Physics Abstracts all ended up with a cumulative value doubling in about 15 years. 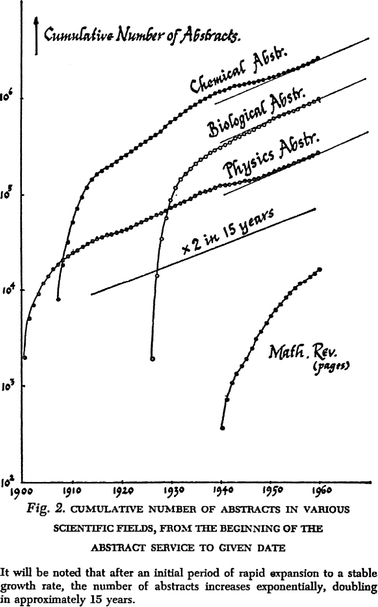 The growth, then, of the actual set of scientific knowledge, grows at an exponential rate. If we were looking for something, I daresay we found it. While it falls short of absolute proof, the exponential cumulative growth of scientific literature is precisely what we would expect to find if the nature of new scientific ideas was combinatorial. And as I mentioned previously, a scientific manuscript cites the work it is based on—the ideas it is based on, which signifies the combinatorial nature of the work. While the exponential growth of scientific literature is not new, understanding it as a combinatorial process appears to be. Note that just a single extra piece in the available doubles the size of the adjacent possible. It comes as no surprise, then, that some of the most famous inventors in history had lots of hobbies, interests that offer a wide range of pieces to be fit together in new ways. There is another interesting aspect to Price’s work that bears mention. It makes sense to ask ourselves when this 15 year doubling period behavior began. That is, let’s follow the line back until it hits 1. The result: the year 1690. In other words, within a small margin of error away from Newton’s original publication date of the Principia Mathematica (1687). My thoughts are that this is not just coincidence. Newton’s work defined the onset of the modern era of science, which enabled reliable knowledge to seed ideas which became the basis for the Industrial Revolution. The innovations which have gone on to make every measure of living conditions in the modern world so drastically better than ever before in the history of mankind may very well be traceable back to the ideas of one notoriously talented British scientist.